To summarize some of the results of anxiety in our lives, I have chosen to use the simple phrase from 2 Tim. 1:7 called “a spirit of fear”. When we allow anxiety and worry to invade and overwhelm our hearts, we find ourselves in a cloud of fear that had disasterous effects on our personal, relational, and spiritual lives. We have to face up to the results of anxiety as we prepare for the remedy starting in a couple of week. I have included two songs from our worship team under the leadership of Micah Williams and I pray that they touch you as they touched us during the service. We live in a world of chaos and our modern technology has not proven to simply our lives as much as it has proven to complicate our daily existence by constant contact with the troubles, fears, and strife of life around the world. We as Christians are called to a different lifestyle than the world. We are called to PEACE not worry! However, the church is filled to brim with worriers and they find the reality that worry destroys relationships, visions, and personal health. How can we choose peace? How can we defeat the enemy of anxiety? In the next few sermons in this series, we take the Biblical command seriously to “Be anxious for nothing” and we will discuss what the bible says about how we can defeat anxiety as a way of life in all of us. 1. TheRealization – that we don’t have to live a life of anxiety! We are called to peace! 2. The Roots – the first thing that we do when anxiety rises in us is to identify the root of the anxiety. When we know where it is coming from, we can direct our minds and hearts in prayer and proclamation in THAT area. 3. The Results – Our choices have consequences! When we choose anxiety over peace, we have chosen to go against the Biblical command and the results are devistating to our personal spiritual relationship with Christ, our relationships with others, our productivity as a person, and our joy and peace in general. 4. 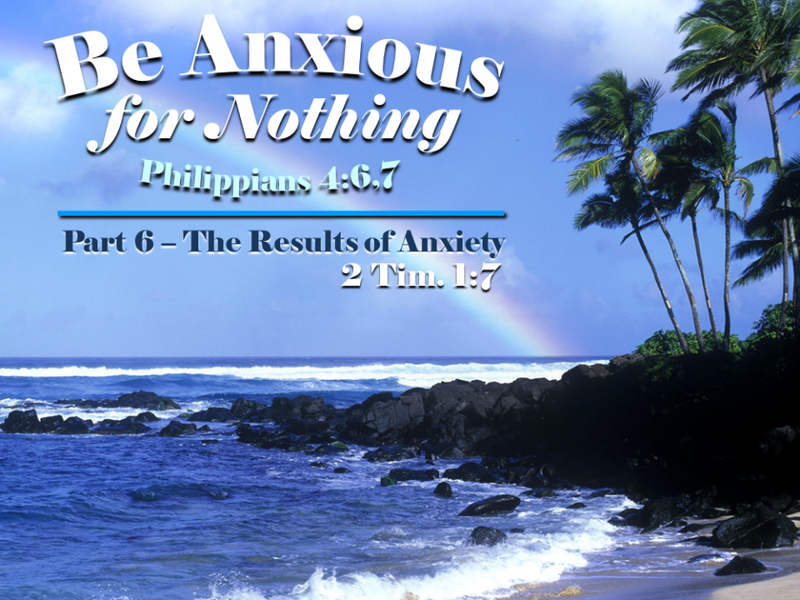 The Remedy – We come full circle back to the theme verse in Philippians 4:6,7 and we see that there is specific things that we MUST do if we want to turn the tide of anxiety! We choose peace – then we must make the necessary choices that follow that to bring God’s promises and God’s Spirit into bear on our minds and hearts.